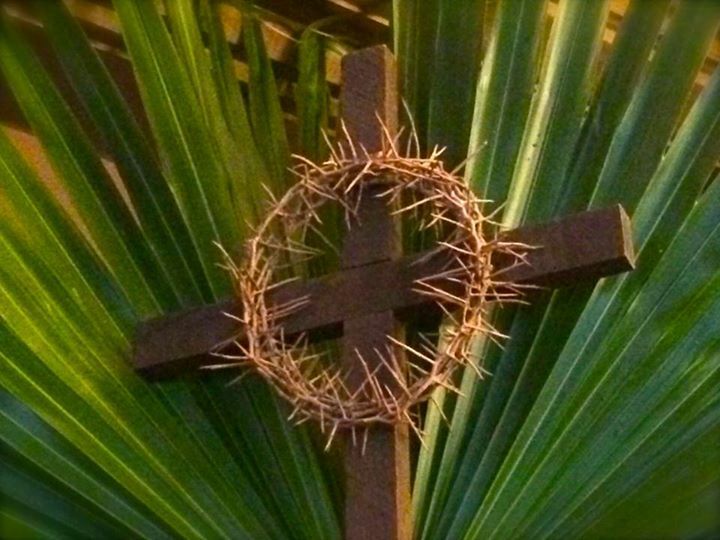 Today is known as the Sunday of the Passion: Palm Sunday. (There are two gospel readings: Matthew 21:1-11 (the triumphal entry) and Matthew 27:11-54 (the passion)). I’ve been wondering and thinking though about a different name for this day. What if we renamed today “Turmoil Sunday?” Does that sound like the gospel to you? Did you show up today hoping or expecting Jesus to bring some turmoil? Is the turmoil bringing Jesus the one you want to know and follow? My guess is that, for most of us, the answers to those questions are, “No, no,” and “no.” I can honestly say that I have never prayed for Jesus to bring me some turmoil and I’m betting most of you haven’t either. Most of us probably pray for and hope Jesus will bring just the opposite: some peace and calm, answers to our questions, and solutions to our problems. We didn’t come here today looking for turmoil. We came to hear the story of Jesus riding a donkey, to sing our hosannas, and to get our souvenir palm. I suspect the crowds that followed Jesus weren’t so different from us. A ride on a borrowed donkey, songs of celebration and praise, garments and branches that fall before Jesus like the confetti of a ticker tape parade; now that’s a triumphal entry. It was for them and it is for us. Most of us are probably pretty happy to leave it at that. So why would we rename this day “Turmoil Sunday?” Despite what we see, our expectations and hopes for the day, and even what we want to believe, the city itself, Jerusalem, has a very different experience of and response to Jesus’ triumphal entry. “When he entered Jerusalem, the whole city was in turmoil, asking, ‘Who is this?’” Jesus and turmoil seem to go together. I wonder if Jerusalem sees and understands something we don’t. I wonder if we are too easily distracted by the donkey, hosannas, and palms so that we miss what is really happening. I wonder if the city’s response just might be the most faithful and appropriate response. Maybe we should all be in turmoil this day. Maybe turmoil is today’s good news. Maybe the turmoil Jesus brings is exactly what we need. St. Matthew makes it very clear that turmoil sets the tone not just for today but throughout this entire week and even into Easter. It is not, however, our usual understanding of the word turmoil. It is more than just chaos, confusion, and uncertainty. The Greek word that has been translated as turmoil really means to shake or quake and is descriptive of what happens in an earthquake. St. Matthew uses this same Greek word to describe Jesus’ entry into Jerusalem, the shaking of the earth and the splitting of the rocks at Jesus’ crucifixion, the earthquake that accompanies the angel coming and rolling the stone away from Jesus’ tomb, and the shaking of the guard who stood at the tomb. In all these St. Matthew is describing seismic events in which our lives and our world are shaken to the core and something is destroyed. That’s what earthquakes do. The destruction wrought by Holy Week, however, is not the end but a new beginning. The tremblers of this week will forever change who we are and the life we live. On Monday the fragrance of love will mingle with the coming death of Jesus and everyone in the house will be shaken. On Tuesday the invitation to die before we die will become the epicenter of our faith. On Wednesday Judas’ betrayal will reveal the fault line in all of us. On Thursday we will tremble at the intimacy of touching and washing another person’s feet and having them touch and wash ours. On Friday the earth will quake as the cross of our creator is plunged into the heart of death. The silence of Saturday will cause the gates of hell to shudder and burst open. So let me ask you this. What parts of your life and world need some Jesus kind of turmoil? What in you needs to be shaken awake and back to life? What has become foundational for your life but no longer supports your life? What are the old ways of thinking, seeing, and acting that just need to crumble and fall? In what ways have you become a prisoner of the very structures upon which you built your life? Somewhere in each of our lives we need the triumphant turmoil of Christ. It is the devastation of everything in us that keeps us from being fully alive, fully ourselves, and fully God’s. It’s the devastation that creates space and place for a new foundation, a new structure, and a new life. The turmoil of this day is also the triumph of this day. 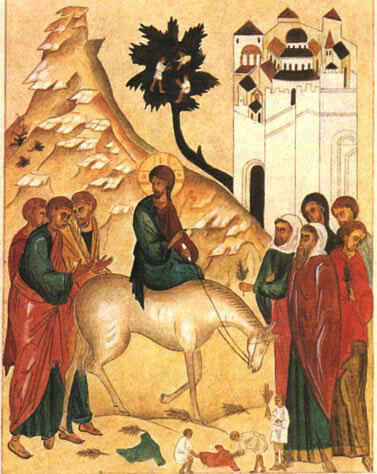 The triumph of Palm Sunday is not in the donkey, the hosannas, or the palms. It is Christ’s earth shaking entry into our world and our lives. It is a triumph that will continue to be revealed throughout this week. It is a triumph that happens whenever and wherever Jesus is present. “Thrilled and scared” is probably the best way to approach Holy Week! I hope it is a blessed week for you. I am privileged and grateful to have you as a parishioner. Thank you. May God bless you abundantly this week and take you to the joy of Easter. No words can depict this inhumanly harsh process. It comes a moment when you feel like you literally crumble. Nothing more or less: you´ re being torn apart. Nothing to hold to. Everything falls apart as if you are being dissolved. You can´t even take a step. Nowhere to go.. You are where you are…It is truly agonizing. This devastation is like dying while being alive. Yes, Julien, we are dying to live. You’ve described well Holy Week and the passion of Christ. Peace back to you Mike. You wrote “In what ways have you become a prisoner of the very structures upon which you built your life?- resonated with me. We have “Mind of Christ” (1Cor 2:16) I have found that some of the things I held onto in my thinking were things that restricted my growth. When I began to change the way I thought- these structures I built dissolved…What freedom we can have in Him! Many of the spiritual battles I once thought were out there in the world really were in the way I was thinking.Thanks for another well written and challenging post! Those are great insights Steve. I think you are correct that the spiritual battle is an interior one. So many of Jesus’ miracles and the healing he offered dealt with blindness. There seems to be a close relationship between thinking and seeing. Thank you Sandi. I hope you are having a blessed Holy Week.